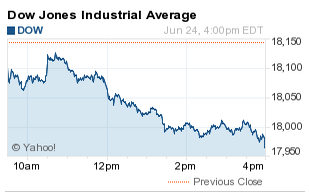 The DJIA today fell 178 points as traders felt jitters over the current negotiations between Greece and its creditors. This morning, European ministers and creditors rejected a number of new proposals from the debt-ridden nation to reach a deal by this Sunday. The nation's creditors are demanding greater concessions and sweeping reforms. However, anti-austerity leaders have been highly unwilling to agree to such terms. The S&P 500 Volatility Index (VIX), the market's fear gauge, jumped 9.4% today. Slowing Economic Data: Greece worries dominated the news, but investors were also unnerved by news that the final revision of first-quarter GDP registered at negative2%. That's a slight uptick from the negative 0.7% calculated during the second revision of the growth figure. Economists blamed bad weather, a strong dollar, capital expenditure cuts in the oil industry, and disruptions at West Coast ports for the final, negative reading. Activist Insight: This afternoon activist investor Carl Icahn warned that he thinks the U.S market is "extremely overheated — especially high-yield bonds." The news comes the same day that Icahn announced via his Twitter Inc. (NYSE: TWTR) account that his company Icahn Enterprises LP (NYSE: IEP) had sold its remaining shares of Netflix Inc. (Nasdaq: NFLX). The billionaire earned an expected $2 billion on the trade. On Tap Tomorrow: On Thursday, investors will listen to the speeches of two Federal Reserve members about monetary policy and their feelings on when the central bank may take action on interest rates. In addition, keep an eye on weekly jobless claims and a monthly report on personal income. Companies reporting earnings Thursday include Accenture Plc. (NYSE: ACN), AZZ Inc. (NYSE: AZZ), Barnes & Noble Inc. (NYSE: BKS), Finish Line Inc. (Nasdaq: FINL), and Mad Catz Interactive Inc. (NYSE: MCZ). Stocks to Watch No. 2, MON: Shares of Monsanto (NYSE: MON) slipped nearly 6% on news the global leader in seed manufacturing will continue to try to court and ultimately purchase its Swiss rival Syngenta AG (NYSE ADR: SYY). The deal continues to face skepticism from Syngenta shareholders. The U.S. government is likely to have significant regulatory concerns as farmers will likely register objections. Stocks to Watch No. 3, AAPL: Shares of Apple Inc. (Nasdaq: AAPL) gained more than 1% intraday after Carl Icahn said he thinks the company faces the same investment opportunity that his firm saw in Netflix several years ago. Apple announced today it has struck a deal with several independent music labels ahead of its June 30 launch of Apple Music. Stocks to Watch No. 4, LEN: Shares of Lennar Corp. (NYSE: LEN) jumped more than 4.2% as the nation's second-largest homebuilder beat Wall Street earnings expectations. The company reported a 33% jump in profit thanks to homeowners purchasing new construction at higher prices. The news comes just a day after the U.S. Commerce Department announced that new home sales were at a seven-and-a-half-year high.